Hello, my crafty friends. Welcome to the April Paper Crafting Monthly Blog Hop! 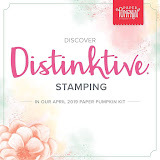 I am participating in this blog hop with fellow Stampin' Up! demonstrators from the United States, Canada, Australia and United Kingdom. You might be starting the blog hop right now, or you may be coming from Katie Johnson's blog. Welcome one and all. 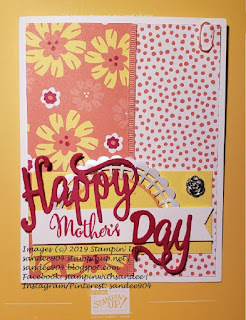 The theme for our blog hop this month is anything "girls" -- so a Mother's Day card it is!! I fell in love with this sheet of Pineapple Punch flowers on the Grapefrut Grove background from the Happiness Blooms Designer Series Paper! 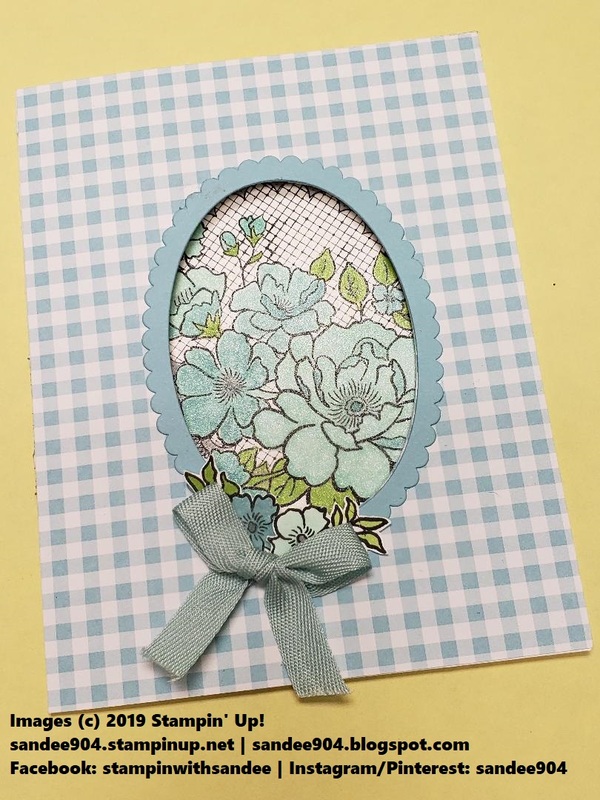 My original plan for this card was to feature the Bloom by Bloom bundle (Occasions, pp. 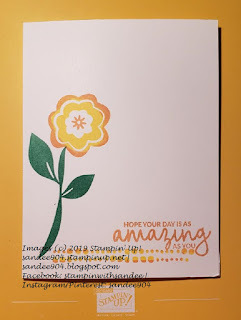 24-25) on the front of the card, however, I decided to switch it up and stamped the flower on the inside of the card with the beautiful sentiment from Incredible Like You (Occasions, p. 21). 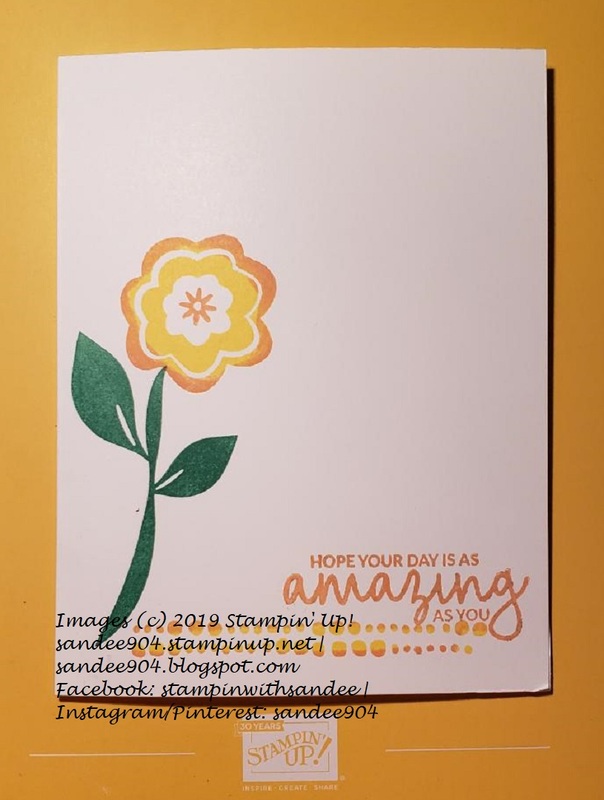 You have to admit that this is a great collection of flower stamps, dies, and DSP!! 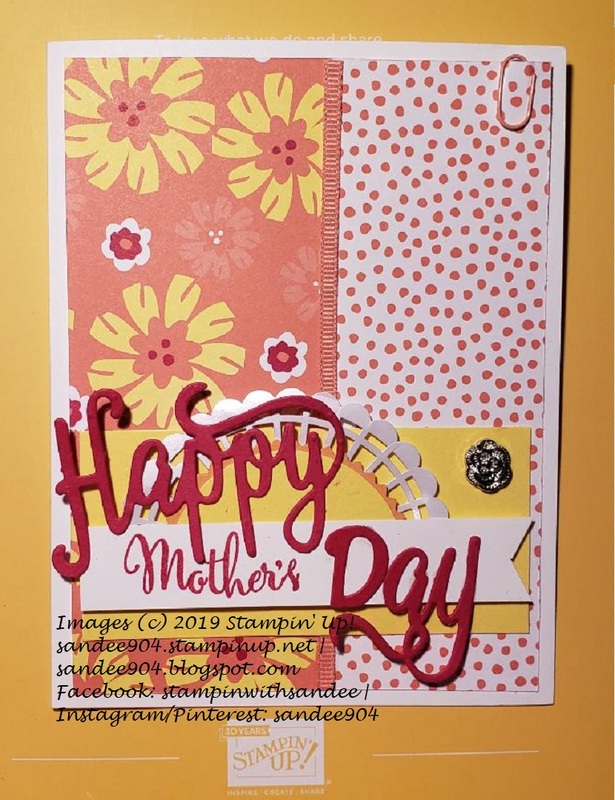 Then I found myself in quite a pickle when I searched my current stamp collections for a "mother's day" sentiment for the card front. You may recognize the Happy Birthday die (Annual, p. 217) here. I snipped apart "Happy" and "day" die cut from a piece of Lovely Lipstick. I carefully stamped together letters from the Make A Difference stamp set (Annual, p. 178) to form the word "Mother's." I am not gonna lie, this was quite tricky on my first use of these tiny letters, but the Stamparatus really made this work!! So pretty. This card also features a paperclip and silver rose from the Share What You Love Embellishment Kit (Annual, p. 178), a partial Pearlized Doily (Annual, p. 192), a peek of Grapefruit Grove using the Starburst punch, a half moon of Pineapple Punch from the Circle Punch (Annual, p. 210), and a strip of Grapefruit Grove 1/8" Grosgrain Ribbon (Annual, p. 183) to disguise the cut of the DSP slightly off center to line up with the sentiment. Thank you for stopping by my blog today! I sure hope you have enjoyed my Mother's Day card. Leave a comment below with a trail to find you so I can see your creations. All the supplies used in these projects can be ordered through my online store. Please use the hostess code found on the sidebar of my blog when ordering through my online store. Do NOT use this Hostess Code if your order already qualifies for Stampin' Rewards ($150 USD). How awesome was the anniversary March Paper Pumpkin kit. I hope you were able to subscribe in time for the April Paper Pumpkin that should be arriving any day now. New month's Paper Pumpkin kit will feature a kit put together by Shelli Gardner. I am sure you cannot wait either. As always, it would be my pleasure to be your demonstrator if you do not already have one. I would love to share a copy of the 2018-19 Annual Catalog and the 2019 Occasions Catalog with you. Message me if you are interested, if you have any questions, or need any assistance whatsoever. Hello my crafty friends. Today I want to share with you an easy handmade card for your Easter holiday greetings. 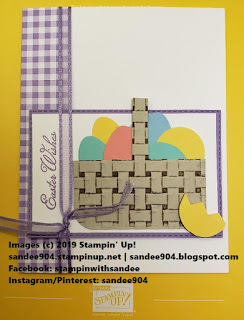 In class this month, we made these beautiful cards using the Lovely Lattice stamp set from the Sale-A-Bration catalog and created a frame using the new Rectangle Stitched Framelits Dies with the Gingham Gala 6x6 Designer Series Paper. 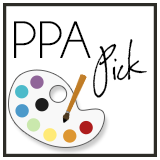 (Click HERE for a link to the blog showcasing the card.) After cutting out the frame, there was a decent length of scrap left, perfect for this card. The basket is from a large scrap of Sahara Sand card stock and the texture is created from a sweep of Early Espresso ink on the front flap of the Basket Weave TIEF. I hope you have enjoyed my card today. Forgive me for not using a current sentiment. I used one of my all time favorite retired sentiments, Easter wishes. And the ribbon is the out of stock Sale-A-Bration Heather Organdy Ribbon Combo Pack in Highland Heather. There is still plenty of Sale-A-Bration products left and there are still 4 days to place your qualifying order to earn one, or two, or several. 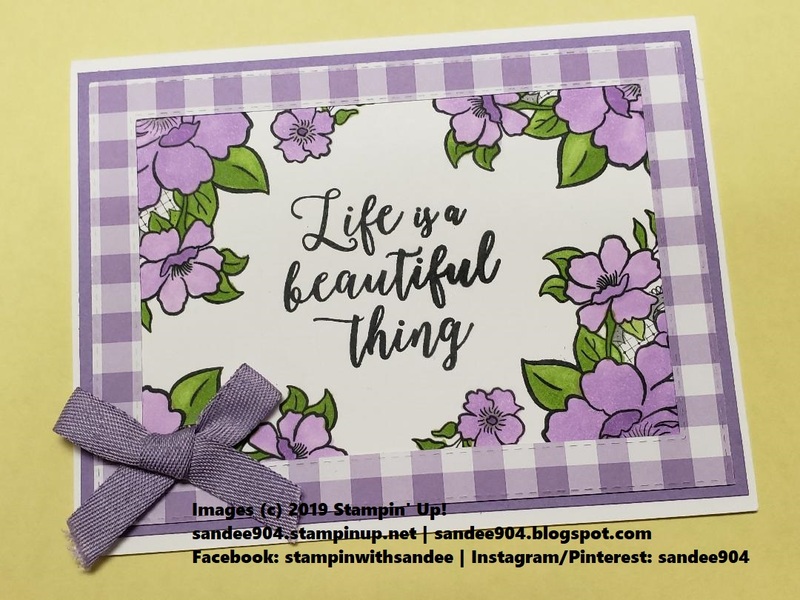 If you do not already have a Stampin' Up! demonstrator, I would love to be yours!! You can reach me at my contact info below. Hello, my crafty friends. Welcome to the March Paper Crafting Monthly Blog Hop! 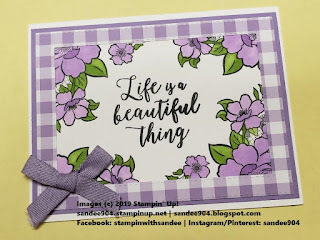 I am privileged to be participating in this blog hop with fellow Stampin' Up! demonstrators from across the United States, Canada, Australia and United Kingdom! You might be starting the blog hop right now, or you may be coming from Terri Stewart's blog. Welcome one and all. This month all our projects will feature birthdays. 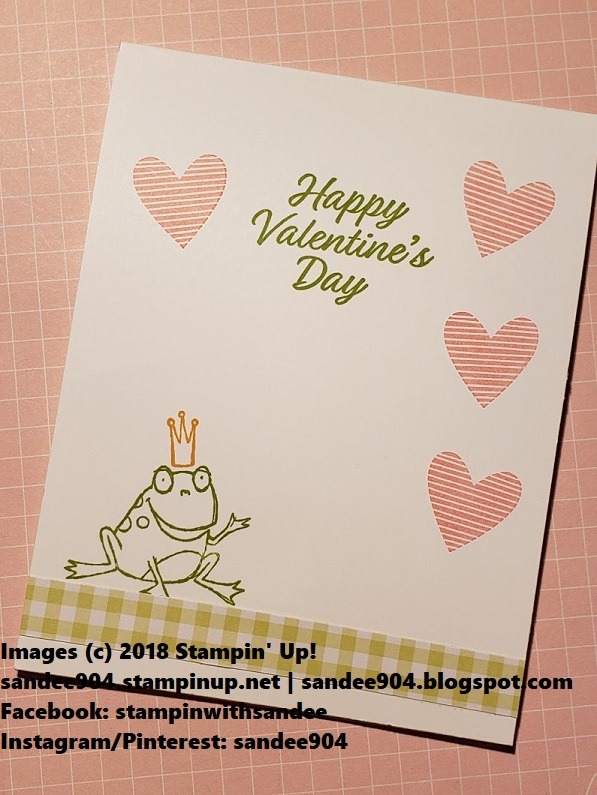 I wanted to try a double Z fold card and I really wanted to use the Meant to Be stamp set to show how the hearts could be used for something other than Valentine's day. This is a picture of the card front. What do you think about this super cute DSP and that Balmy Blue heart? Love it. The card base is Lovely Lipstick cardstock. Thank you for stopping by my blog today! I sure hope you have enjoyed my card. Leave a comment below with a trail to find you so I can see your creations. Click on the "Next" button below to visit Sue McDonald's blog and be sure to check out the projects of all the participating Stampin' Up! demonstrators (full list below too). It would be my pleasure to be your demonstrator if you do not already have one. I would love to share a copy of the 2018-19 Annual Catalog, the 2019 Occasions Catalog and the Sale-A-Bration Catalog with you. Message me if you are interested, if you have any questions, or need any assistance whatsoever. Have you seen the Second Release and Third Release of Sale-A-Bration products and the Coordinating Products List? Message me and I will email you a copy of the flyers. Paper Pumpkin is 6 now!! I hope you were able to get a kit. It sure will be fun putting together cards with the two - YES 2 - stamp sets. Do not miss out on April's kit. Did you know that you can purchase prepaid subscriptions to Paper Pumpkin in 3-, 6-, 9-month and 1-year increments, which earn free Sale-A-Bration products. Message me for more details. Hello, my crafty friends. 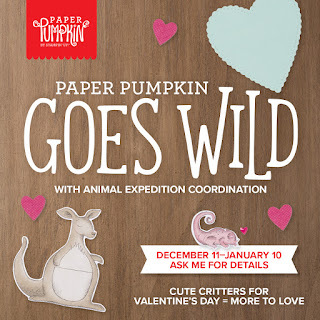 Welcome to the February Paper Crafting Monthly Blog Hop! 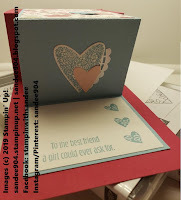 I am privileged to be participating in this blog hop with fellow Stampin' Up! demonstrators from across the United States, Canada, Australia and United Kingdom! You might be starting the blog hop right now, or you may be coming from Sandra Roberts' blog. Welcome one and all. 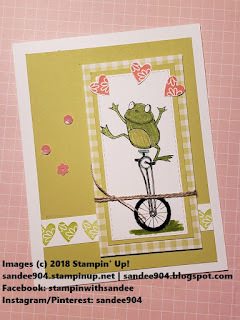 February is the second month of Sale-A-Bration and the theme for our blog hop this month is to feature any one of the amazing free products from the Sale-A-Bration catalog in our projects. I had several products to choose from, but I wanted to color so I selected the Lovely Lattice Stamp Set (p. 15). Coloring is so peaceful to me. 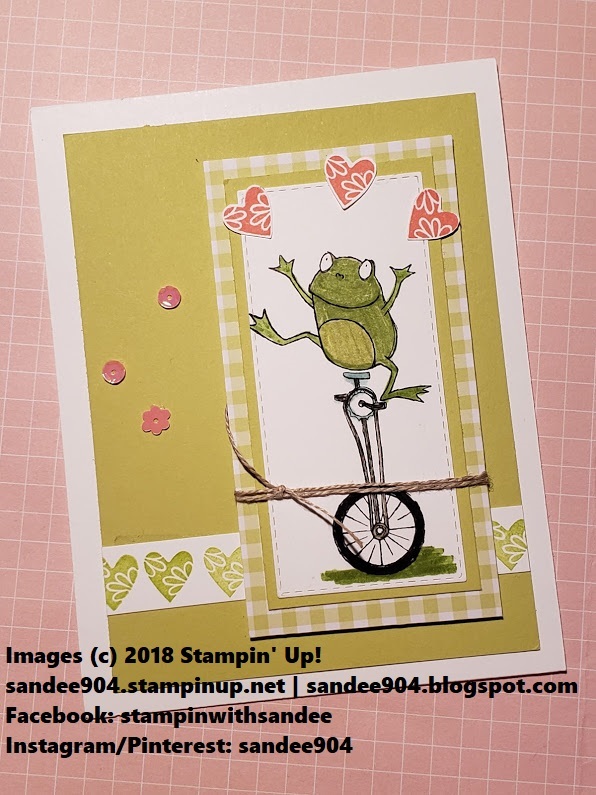 This first card is a "peek-a-boo"card, meaning that the featured image is stamped on the inside and a window is created on the front of the card to "peek" inside the card. The window is created with the second largest oval from the Layering Ovals Framelits that fits inside the largest scallop oval and then use both to create the window frame. This second card is a "framed" card. I built the frame using the largest and third largest rectangles from the new Rectangle Stitched Framelits using the Gingham Gala 6x6 DSP in Highland Heather to match the flowers. 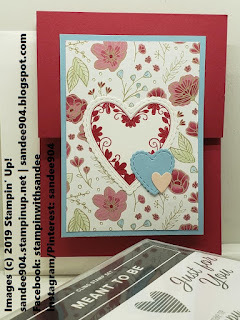 The flowers were stamped around the edges of a 5 1/2 x 4 1/4 piece of cardstock using the Stamparatus. (I have a template. If you are interested, message me.) The bow is the 3/8 Classic Weave Ribbon in Whisper White colored with the Stampin' Write Marker. (Highland Heather) The sentiment is from Colorful Seasons. Thank you for stopping by my blog today! I sure hope you have enjoyed my cards. Leave a comment below with a trail to find you so I can see your creations. 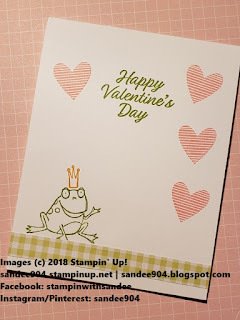 Please check out the projects of the participating Stampin' Up! demonstrators - click on the "Next" button below to visit Sue McDonald's blog. Have you seen the Second Release of Sale-A-Bration products? Message me and I will email you a copy of the flyer. Paper Pumpkin turns 6 next month. It will be big for sure so be sure to subscribe in time (March 10). Did you know that you can purchase prepaid subscriptions to Paper Pumpkin in 3-, 6-, 9-month and 1-year increments, which earn free Sale-A-Bration products. And how awesome was the February Paper Pumpkin kit that coordinates with the Animal Expedition Suite (AC pp. 26–27)? I would love to see your creations. Hope you had a fantastic Valentine's Day.